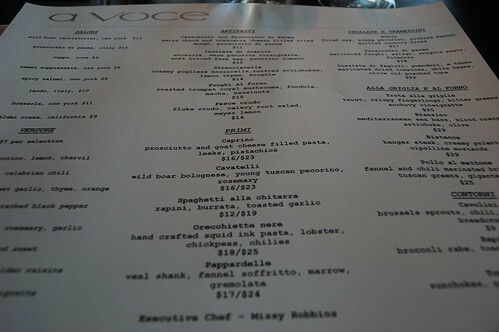 Katie, Laura, and I capped off our spring break weekend with a splurge at A Voce at Columbus Circle. The view, the quiet ambiance, and the refined but delicious food were everything I needed to conclude a great week of relaxation before coming back to law school. 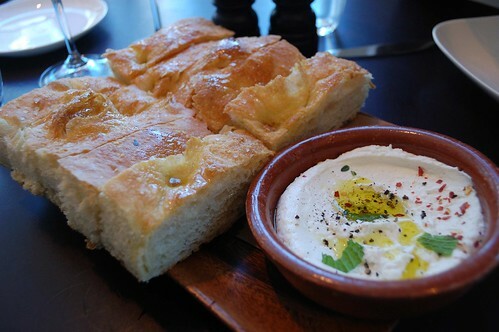 We started off with the homemade foccacia and ricotta spread, which unlike the bread basket in other restaurants, was most definitely not an afterthought. As an appetizer, we got the cassoncini with prosciutto. 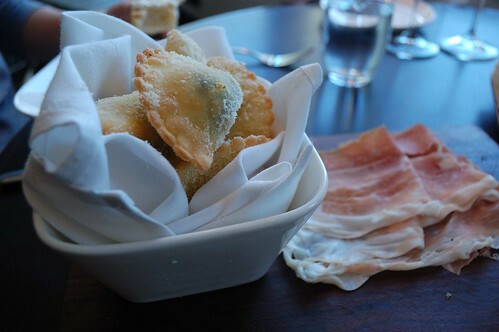 The cassoncini were absolute heaven, essentially crispy fried Italian wontons filled with Swiss chard and creamy cheese and then dusted with Parmesan, and the fat on the accompanying prosciutto di Parma melted between your fingers as you tore it into bite-sized shreds. We could’ve ordered 3 servings as a meal and still be just as happy. 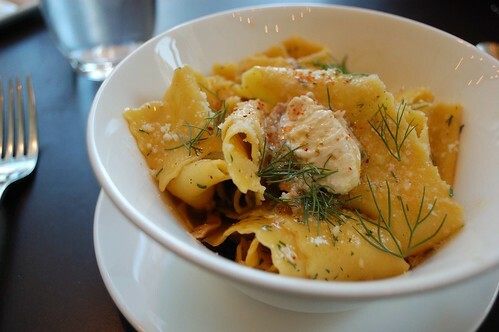 For our entrees, Katie got the fried egg, pecorino, and pickled fennel on grilled country bread, Laura ordered squid ink orecchiette with lobster, chickpeas and chilies, and I ordered the pappardelle with veal shank, fennel sofrito, and bone marrow. 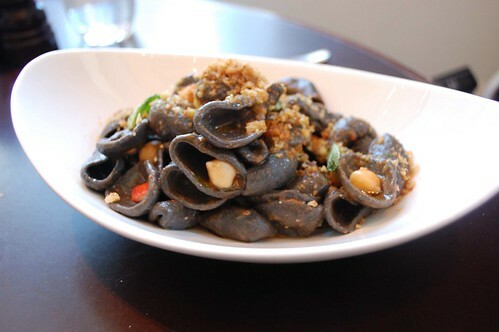 My pasta tasted just as good as the last dish I ordered at A Voce (loved the addition of bone marrow that richened the rest of the sauce), and Laura’s orecchiette, though very new to me, definitely had a unique taste imparted from the squid ink in the pasta that could only be described as “ocean-y.” Katie seemed to have a difficult time eating her dish just because of the crustiness of the grilled bread, but I noticed that there wasn’t a single crumb left on her plate at the end of the meal. The original plan was to order the famous bombolonis (Tuscan doughnuts) for dessert, but we were pressed for time and had to leave to catch our train back to Jersey, meaning we’d simply have to go back another time. This weekend was probably the most fun I’ve had in a while, and it was so relaxing to just walk around in NYC, shopping and eating, with my two sisters. As it turns out, both of them will be in NYC next year (Katie will be a sophomore at Columbia and Laura will be attending Cooper Union), and though I’m a bit jealous that they will be hanging out sans yours truly, at least it means I have not one, but two, free places to stay when I visit! 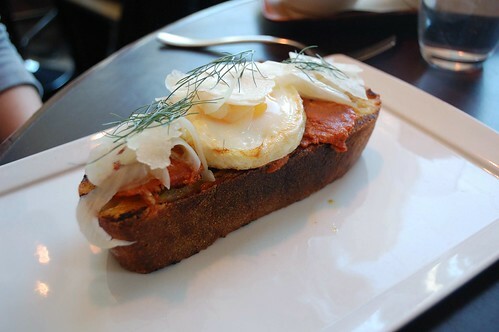 You are currently reading A Voce with Quans 2 and 3 at Notes on Food.